From today until next Friday, February 26th, the free KTQ50 film is Viva La Causa (1974). In the summer of 1967, youth and arts organizations in the Pilsen neighborhood of Chicago began working together with artists Ray Patlan and Mario Castillo to express the history, culture, and struggles of the people in their community. 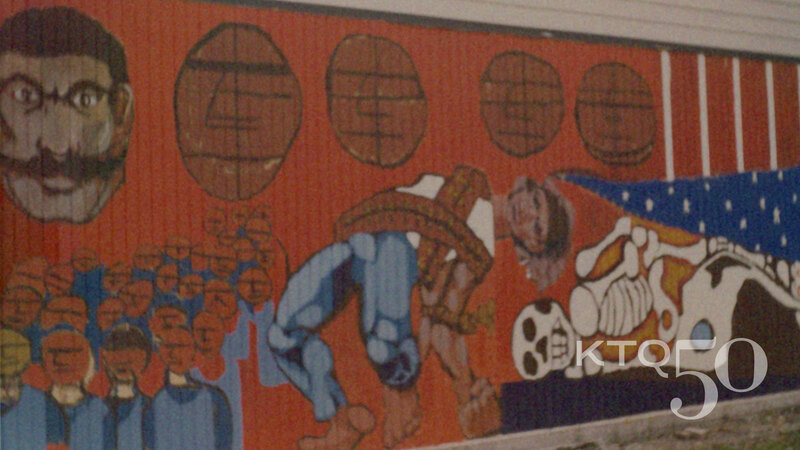 The murals featured in Viva La Causa were the first two Mexican-American murals in Chicago and part of the new public art movement in the late 1960s. Made during Kartemquin's Collective era, the film intended to document youth participation in Chicago’s vibrant mural movement. The final product was presented in communities to show them how art could be a source of pride for young and old alike. The film's original 16mm print was restored through a grant from the National Film Preservation Fund in 2012. Muralist Ray Patlan is the creative pillar behind over 100 murals within the U.S. and around the world. His work has involved directing and/or executing murals across the United States, Mexico, Asia and Europe. Although currently residing in Oakland, California, his earliest work and study finds its roots in the Chicago barrios in the neighborhood of Pilsen explored in Viva La Causa. On Saturday, March 12th at 2:00 PM, WTTW in partnership with the Department of Cultural Affairs and Special Events and Kartemquin Films presents a free screening and discussion celebrating 50 years of Kartemquin Films. The screening will be celebrating three short works from the earlier years: Now We Live on Clifton (26 min., 1974), Winnie Wright, Age 11 (26 min., 1974) and Viva La Causa (12 min., 1974). Original Kartemquin Collective members will be present for a panel discussion and Q&A from the audience after the screenings. - Video: A preview from the Kartemquin Films Collection: The Early Years Vol. 4 (coming soon!) extras. Compare side-by-side, the original transfer and the restored files of Winnie Wright Age 11, Now We Live On Clifton, Trick Bag, and Viva La Causa. - Original Poster: Designed by KTQ Collective member, Betsy Martens, for the former "Haymarket Film and Video" screening operation that ran out of 1901 W. Wellington Ave. The screening features back-to-back screenings of Winnie Wright Age 11, Now We Live on Clifton, and Viva La Causa.